JBG considered various possible uses, including office, condo, and hotel, but in the current economic climate, the only ones that made sense were “independent living” with some retail. “Independent living” are apartments exclusively for older adults (seniors) who are living without medical or domestic assistance, in other words, age-restricted, non-assistive residences. They believe this is an ideal location for “independent senior” housing because it’s within walking distance of many desirable amenities, such as VisArts, county library, gym, grocery store, and Metro. The result would be a project about 4-5 stories high (mid-rise buildings similar to the Town Center) with retail on the first floor and residences on the upper floors (similar to the Alaire project), filling the site to the sidewalks and look more urban than suburban. Groundbreaking will probably occur in two years, but ideally it would be in one year if permits and plans are approved by the city in a timely manner. Greenberg showed two conceptual plans–one of the ground floor and one of an upper floor–to show a possible layout of the parcel but no elevations. 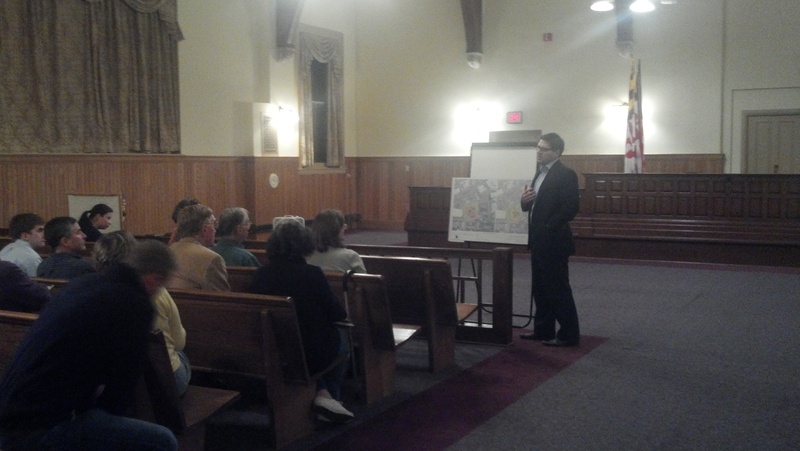 Although this was an informal meeting and nothing has been submitted to the City, the project did elicit many questions from the audience, including the inclusion of green space (trees, grass) or a bandshell, avoiding a “fortress-like” design that’s isolated from the community, the taking of adjacent properties through condemnation, noise from concerts, and parking spilling out into adjacent neighborhoods. Future official community meetings will be planned if the project proceeds, so stay tuned or inform Tony Greenberg at JBG (tgreenberg@jbg.com) if you’re interested in attending. 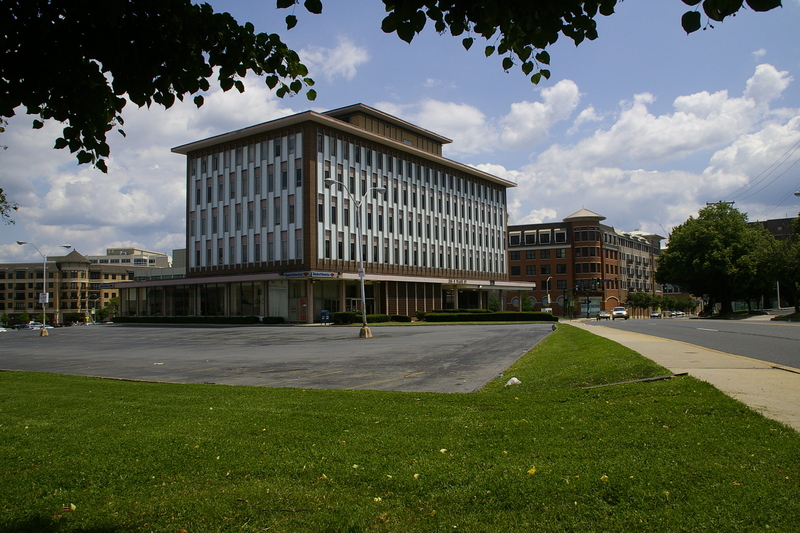 As an aside, I did learn a bit more about the status of the “mid-century modern” Bank of America/Suburban Trust Bank building at the corner of Washington and Beall. It’s a bit complex but as I understand it, the land and building are owned by Cornerstone, Kettler manages the property, KSI Services has a lease for development, and is one of the half dozen PDPs (planned development projects) in the city (although it’s even more confusing because KSI Services changed its name to Kettler in 2006). Plans to develop it for Town Center 2 fell through due to the economy and the site plan has expired. I also learned that a Safeway is being planned near the Twinbrook Metro station–does that mean the nearby Safeway in the Twinbrook Shopping Center will close? Wondering what else is happening? The City of Rockville has a nifty map showing the locations of all developments in process. Do you have any more details about the Safeway by the Twinbrook Metro? I’m afraid I don’t. It was mentioned by Tony Greenberg as a passing reference to the type of mixed use projects they’re currently doing in the City and I suspect it’s part of the project on the westside of Twinbrook Metro. I thought I might have misheard it but Susan Prince confirmed she heard the same remark. You might have to ask Tony Greenberg or Jim Wasilak for more details. Nevermind, I think I found it: http://www.rockvillemd.gov/zoning/development/1800RockvillePike.html. Looking at the site on Google street view, it looks like it’s the next lot south of the Hilton, a lot currently occupied by a furniture store that I can’t recall ever having seen, despite the fact that I’ve driven by there dozens of times. More to the question you raised, whether the Twinbrook Shopping Center Safeway would close: It looks like the proposed new Safeway is only 1.8 miles south (via Twinbrook Parkway) of the existing Safeway on Veirs Mill Road. That’s pretty close. Additionally, there’s another Safeway on Norbeck Road only about 1.6 miles north of the current one in Twinbrook. It’s hard to see how they would need that many of them clustered so close together. Unless they’re anticipating that the clientele of the new store is going to be entirely composed of new residential customers from the Twinbrook Station redevelopment, I’d be pretty surprised if the one on Veirs Mill makes it. 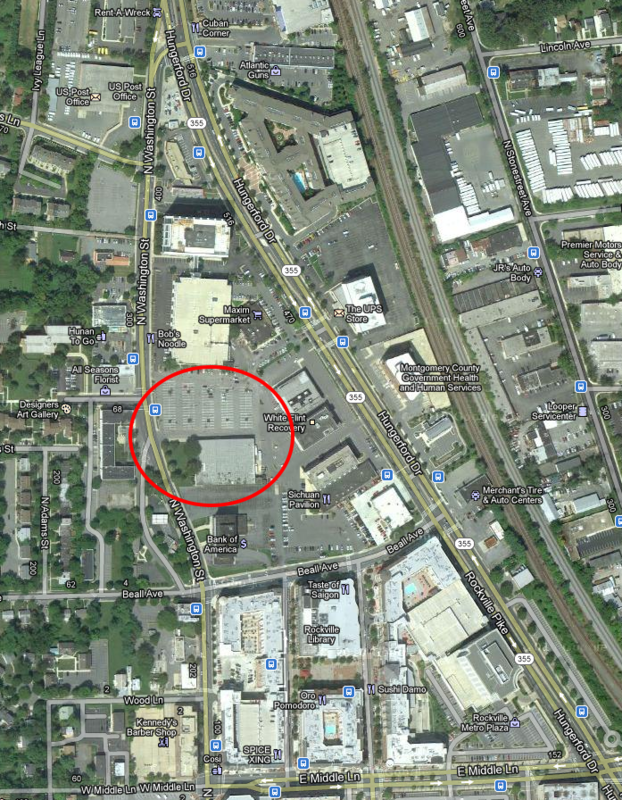 Then again, I think the Twinbrook Shopping Center is owned by JBG too, like the proposed new development. Twinbrook Shopping Center seems to be sucking wind; I’d expect losing its anchor tenant (the Safeway’s the only real reason I go there) would really do it in. You’d think JBG would try to avoid cannibalizing itself, but who knows what goes into these types of decisions. Wow! Thanks for the additional details–that helps a lot. But I believe the Twinbrook Shopping Center (built in the 1960s in the “modern California style” for those who haven’t visited) is owned by a fellow in Chevy Chase/Friendship Heights and JBG Rosenfeld manages the leases. I know that the Twinbrook neighborhood has been trying for years to improve the appearance of the shopping center with little success (can we at least steam clean the walkways and enclose the stinking trash dumpsters? ), which is why I use the Safeway on Bauer even though the one on Viers Mill is just a couple blocks away from my house. Who does the TCAT report to, who are its members? When do they meet and are the meetings advertised in advance? Thank you for this report, Max. I hope they consider the dire need for low cost housing for seniors. TCAT is one of those para-commissions like the Communications Task Force and Bike Advisory Committee that according to the City’s website, “work with the Mayor and Council, as well as City staff, to benefit the community. These groups are not officially listed in the City Code, but are an important part of the public stakeholder process.” Its activity and influence vary (Councilmember Mark Pierzchala was once its chair), but unfortunately, there’s no recent information about the group online and the City website has no more information about them. Trapper Martin (ran for Council in 2009) organized last night’s meeting and I believe he has an email notification list. I believe this was a good attempt for JBG to present a proposal on what the possibilities are for the Giant property which they control. This presentation was a first attempt at a conceptual plan. I attended the meeting and individuals asked some valid questions. One always learns something when attending these meetings. Thank you Trapper Martin for organizing the meeting and thank you Tony Greenberg for the presentation. As far as the Twinbrook Shopping Center is concerned, we can dream all we want for our own personal wishes, but only when a developer is willing to invest their money will a project be presented. I believe that before a proposal is made the developer has a vague idea of what retail might join the project and what investment might work. Max, you are correct. The website says, ” Rockville has numerous groups that work with the Mayor and Council, as well as City staff, to benefit the community. These groups are not officially listed in the City Code, but are an important part of the public stakeholder process. Fact is, TCAT doesn’t have a live link and all the others do. Their meetings are posted, along with minutes. Why isn’t this committee held to the same standard? This means its meetings, members and actions, for all intents and purposes, are secret. This is not OK. There’s no contact information for Trapper anywhere. I think this is something I will bring to the attention to the city council and the city manager. There never was, nor is there now, anything secret about TCAT. When I was chair in 2008, I put together a mailing list of over 80 names. Minutes were written and sent to the Council and names on the mailing list. The press was always invited. City staff members were frequent guests, including David Levy, Scott Ullery, Burt Hall and others. Sally Sternbach had a standing invitation, and in fact we used REDI staff to get out the invitations and agendas. Mark Pierzchala succeeded me as chair, and he organized a Town Center update session that was SRO at VisArts, with presentations given by City staff, FRIT, etc. Trapper Martin was elected chair after Mark, and the fact is there has not been a meeting of TCAT in probably over a year. Given the sudden activity in what was always considered the site for Phase II of Town Center, it was suggested TCAT should start meeting again. How is it not secret? You of all people, Mr. FOIA. And it’s not 2008. There is NO information posted anywhere that the public can see. Who was notified of this last meeting? What was the agenda? Why wasn’t it posted on the city’s website? How did people get invited to attend? Where are the minutes of the meeting?